Customer satisfaction is our number one priority, and we strive to address all customer concerns from the start of their sales appointment to post installation. We thank you for bringing your concerns to our attention, and regret to hear that you remain unsatisfied. We’ll be further investigating this matter, and we’ll be in touch with you soon. 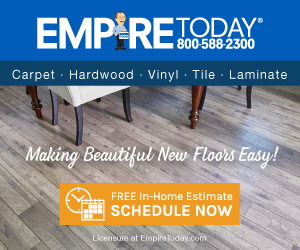 Back in September 2015 I hired Empire to install LVT . I have had moisture issues since the installation. Empire denies that the moisture due to a water leak resulted from them. I paid an extra $1000 to have the damaged tiles repaired. The repair work was never done properly. Tiles are popping up everywhere. It's a tripping hazard. I have been fighting this issue for two years. No satisfaction. They have offered me $1000 to make me go away. The assessor they sent out 3 months ago gave me a written assessment of the shoddy work the contractors performed. His suggestion was to rip the entire floor up and redo it, or else receive a full refund. Empire is not willing to do any of that in spite of the written assessment one of their employees left in my home. My assessment of Empire Today is to stay away from them! I am wanting to be fully reimbursed. I didn't like: Poor follow up on installation, Enitre dealing - never again. Review #1141728 is a subjective opinion of User1141728.